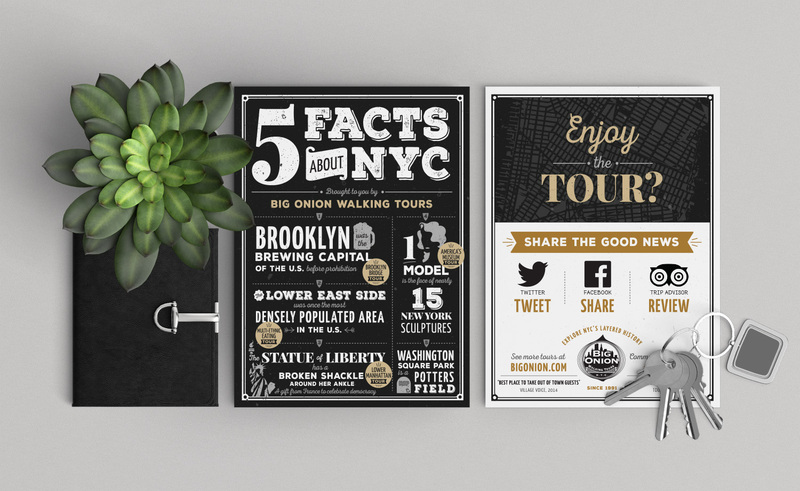 With it’s 25-year mark quickly approaching, Big Onion Walking Tours sought a major update to help them stand out in this newly competitive market. In order to fully understand the business and brand goals of the client I created a design brief to capture attributes and articulate project goals, creative strategy and to ultimately be our guide for the redesign, marketing and ongoing design efforts going forward. The overall goal was to create a more modern brand that would appeal to current customers while attracting new ones. In order to achieve this I looked at several factors. I hired a photographer to shoot tours and tour guides in action, bringing the walking tour to life. In design, I created a more typography-focused look that is in keeping with the historical aspect of the business. And, the website was converted to a responsive layout to accommodate the ever-increasing mobile users, simplifying the overall page structure, and focus on customer needs. Working with a small budget, we did data research using google analytics, anectdotal evidence, user feedback and industry best-practices. 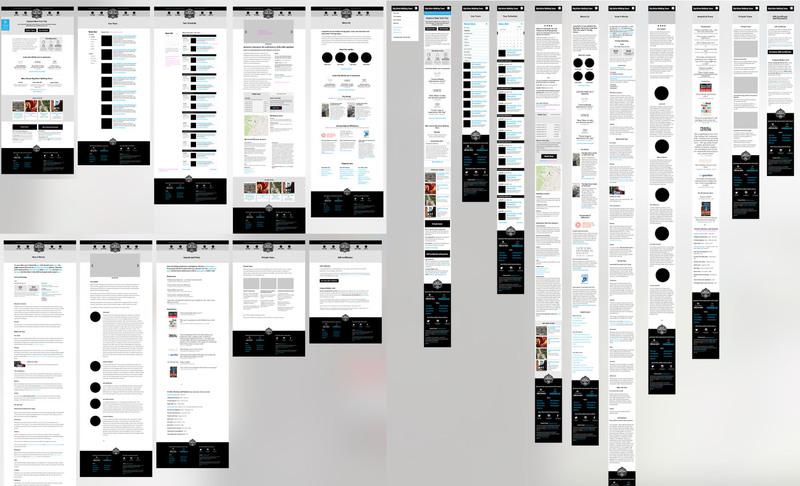 From those I captured current site usage and patterns, created proto-personas and a journey map to rough out the customer experience on desktop and mobile. Individual page goals included creating a more marketing-oriented homepage. Sell the experience by conveying the unique attributes of Big Onion Walking Tours and why they should choose Big Onion over competitors. Create a tour description page that leads customers through the process and answers all their questions (without the need to go to another page). Include a prominent booking button midway down on the page. 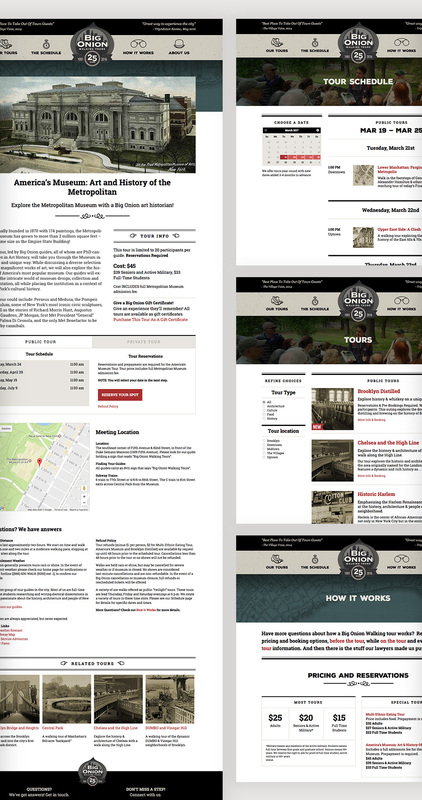 From previous experiments we found the booking button performed better lower down the page (rather than the top). Users seemed more inclined to book after they had more information about a tour. And, finally, we needed to make the tour schedule as user-friendly as possible. The previous version of the website used a plugin that users found confusing. We replaced with a simplified list format that allows users to jump to future dates. Rough wireframes were initially created to set the direction. Then a round of tight wireframes for approval, and finally to design. Mockups were exported to InVision in order to validate the experience. After client (and tour guide) approval it was off to development. While the Wordpress build was underway I then looked to marketing concepts. How we could reach more people. I suggested that the owner try a takeaway postcard. One that was cool and interesting, something they might hang on to or pass it around. But ideally it was to get people to post their tour experience on social media and then follow Big Onion tours. Since the launch, the overall design has been enthusiastically received, engagement is up on the website, and the guides say that tour-goers love the postcards! 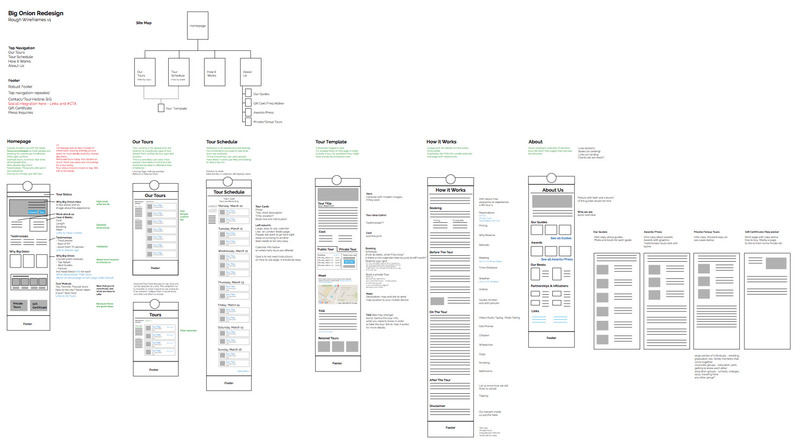 Below are loose wireframes to establish site structure and basic page goals and layout concepts. Tighter wireframes created in photoshop, essentially creating a base for the final mockups in order to save a little project time (and budget). Desktop and mobile screens are shown below. Final mockups were created in Photoshop. In 2016, Lesley worked with us to completely redesign and rebrand our website and internet presence. She managed every aspect of the project and we have seen a significant uptick in both web traffic and revenue since the redesign, enabling us to maintain our leading stature in an increasingly crowded marketplace.